Royal Caribbean International’s Brilliance of the Seas has reemerged from a $30 million drydock. The 2,100 guest ship will now offer vacationers signature Royal Caribbean amenities first introduced aboard Oasis-class ships including five new dining concepts, an exhilarating aerial entertainment experience and technology advancements allowing guests to stay more connected than ever before. In addition, the five-story Centrum – which is the focal point of the ship – has been transformed into a spectacular new space featuring the Centrum experience, which includes the addition of the 60’s-inspired R Bar as well as a multitude of entertainment experiences including enriching daytime activities, nighttime entertainment and a new high-flying entertainment experience where aerialists glide through the vertical space of the atrium. The ship also features a new locatin for the Concierge Club for suite guests, a Diamond Club for Crown & Anchor Society loyalty program members, a new English pub and the popular Royal Babies and Tots Nursery giving parents more opportunities to enjoy the ship’s amenities with peace of mind that their babies are being tended to by qualified care givers. 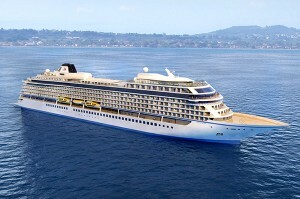 Guests also will find that staying connected at sea will be easier with Wi-Fi access throughout the ship and enjoy a host of technology enhancements that include flat-panel televisions in all staterooms, an outdoor LED movie screen on the pool deck, as well as an interactive digital way-finding system. Old favorites such as the self-leveling pool tables, the adults-only Solarium and the Vitality Spa and Fitness Center can still be found onboard and are sure to delight guests of all ages. The ship will spend a few weeks in Northern Europe before heading to Boston. A voyage will begin this Thanksgiving as Royal Caribbean International®, the award-winning global cruise line returns to the lineup of the 87th Annual Macy’s Thanksgiving Day Parade®. On Thursday, November 28th, the brand new Royal Caribbean float will set sail for a fun-filled family journey that will help ring in the start of the holiday season for millions. Celebrating the fall 2014 debut of the revolutionary Quantum of the Seas, a quantum leap forward in cruise ship design, the float will reflect the adventure and excitement of cruising on a Royal Caribbean ship. While the design is a closely guarded secret, the float will no doubt live up to both brand’s world-class family entertainment legacy. To help kick off the partnership, Royal Caribbean is offering guests the chance to book an ocean view or balcony stateroom for the fare of an interior or ocean view stateroom, respectively, on select Bahamas, Bermuda and Caribbean itineraries. Staterooms must be booked from May 1st through June 5, 2013. The 87th Annual Macy’s Thanksgiving Day Parade airs nationwide on NBC-TV, on Thursday, November 28, 2013 from 9:00 AM – 12:00 PM in all time zones. 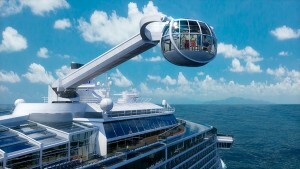 Bumper cars, indoor skydiving, a capsule that lifts you 300 feet above the sea, a flying trapeze – all just a few things that were revealed today aboard Royal Caribbean’s upcoming 4,180-guest Quantum of the Seas – reminiscent of a floating Carnival or Circus at sea. SEE THE VIDEO REVEAL HERE. Two70, an area on the back of the ship that spans three decks and gives an unrestricted 270 degree view of the ocean by day and transforms to a nightly entertainment venue by evening. In SeaPlex guests can experience a circus school with flying trapeze, or play basketball on a full-size regulation basketball court, bumper cars or dance to a DJ. Music Hall is the place for guests to enjoy intimate and exclusive access to live performances, DJs, theme night parties, billiards and more. Rebellious and edgy, Music Hall’s two-story design is inspired by the spirit of rock and roll. Staterooms aboard the upcoming ship will be larger than Oasis of the Seas and every stateroom will have a virtual balcony that brings a digital balcony display in-cabin. Quantum class will debut in fall 2014 with Quantum of the Seas and will sail out of the New York Harbor from her homeport of Cape Liberty on seven- to 12-night itineraries. Holland America Offers Computer Classes at Sea! Holland America recently renewed their partnership with The Digital Workshop powered by Microsoft. With the renewal, the cruise line will continue offering their computers courses to their guests, while rebranding a lot of the classes to include Windows 8. The Digital Workshop powered by Microsoft is available on all 15 of Holland America’s ships. Holland America computer classes are all offered free of charge.